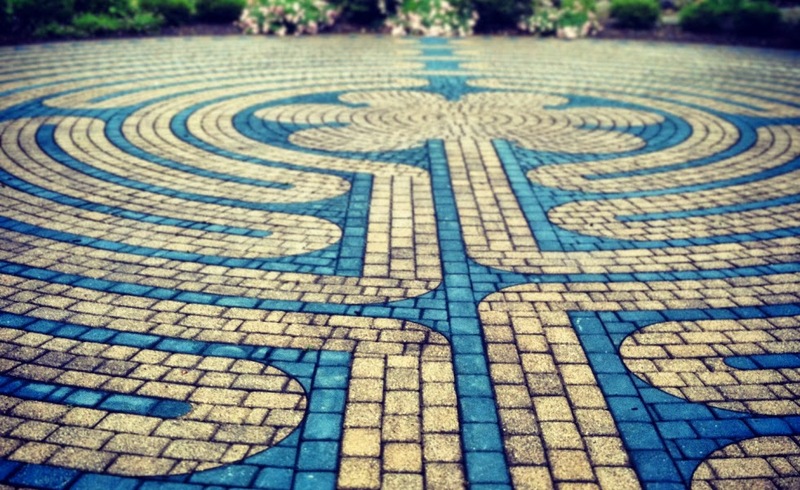 Many of us have walked the labyrinths at Ziontario, Noronto, Encounter or elsewhere in our spiritual formation. I have done so twice before myself. This past week I, with 15 others journeyed upon a labyrinth in the Temple. One of our companions shared that this was his first time and his first impression was….. intellectually and logically, these rows of winding pathways did not make sense. How could this be a meaningful spiritual practice? How could this simple exercise be more than a physical walk and be no doubt boring? But….Upon completing the journey in perhaps 30 minutes within the 40’x40’ canvas creation he said this was one of the most powerful spiritual encounters of his life. For me, all of my previous labyrinth walks had been solo journeys, going inward in my prayerful moments of traversing the winding paths. With many others in our group the experience of the labyrinth became an interactive encounter both with the Divine and also with those on the trek alongside me. The way into the centre is a time of release, emptying oneself, becoming vulnerable to the Spirit. Arriving at the labyrinth centrepoint, I was expectant of receiving, listening, discerning, being mindful of the impress of the Spirit within and around me. On the pathway leaving the centre I was sensing a sending forth, a knowing direction for living my life in ministry. All of these transforming encounters occurred richly. The moments spent within were sacred and sacramental. The presence of others on this pilgrimage became a blessing. As each person approached me on adjacent paths we “felt” in very real discerning ways….. affirming words, deep communion within a gaze, hand touches, embraces, shared meaning that transcended usual fellowship with a purity of heart and sacred oneness. Peace was experienced, a passive joy bubbled up from within and the journey felt like “home.” In our sharing following this spiritual exercise of entering the realms of the Divine one with another, it was evident every single person was attuned to the spirit in new ways; that we were transformed and sent forth with passion to be a witness of this grace and invite others to know personal encounter with the Holy. As a church we are so blessed to have recent prophetic reaffirmation of spiritual formation as our foundational journey to “be” in preparation to “do”. Each of us are incomplete disciples without daily encounter with our compassionate Creator. I urge you to not miss this reality in your life. I invite you to reach out in soul emptying vulnerability that opens you to “presence, peace and passion” We can shed the illusions of our culture and become individually transformed into a prophetic people of blessing. Trust that our individual calling is not an illusion; that our movement borne out of anguished prayer is the model for every single one of us. Let us present ourselves in utmost humility to God who waits upon us and breach the barrier of illusion. Trust in the words, “Be still and know that I am God”.